We are all here to help make your visit as pleasant as possible, so if you have any queries or suggestions, please do not hesitate to approach one of the staff. Our qualified Nursing Staff are also able to help with a large range of treatments and general first aid. Our standard appointments are 15 minutes long. If you require more time, please feel free to book a longer appointment. We realise that your time is very important, so please feel free to ring and check if your Doctor has been delayed before you come to the surgery. Each day we have a Duty Doctor rostered on with whom we can offer 5-minute appointments, however it may not be with your regular Doctor. These appointments open at 8.30am each day, according to availability. You must call at 8.30am for this type of appointment. Insurance & Pre-employment medicals; Hospital & Nursing home care; Marital, family and relationship counselling; Bereavement counselling; Stress Management; Sports injuries; Childhood, Travel & Q-Fever Vaccinations; Obstetrics; Pap Smear & Antenatal clinics; Healthy Nutrition; Weight reduction; Smoking Cessation; Sexual Health; Diabetes Education; Over 75 Years Medicals; Care Plans; Asthma Education and 24 Hour BP Monitoring. 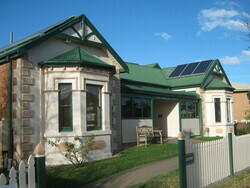 1800 022 222 or visit the Cooma Hospital, Bent Street, Cooma. Patients are welcome to phone in for test results after 10.30am. Staff cannot give your results to anyone else unless we have your written authority. Theatre fee $35.00 for procedures. Pap smear with mid wife $26.00. Other types of consultations are available and prices are available on request. Patients who hold a Health Care Card, Pension or Concession Card will be bulk billed. Bulk billing is also available for Veteran Affairs cardholders (Gold Cards & White Specific). The practice accepts cash and EFTPOS. Accounts are not normally available, however in an emergency, we can arrange something for you. If you have difficulty with payment, please discuss this with the Practice Manager or your Doctor. Please feel free to discuss a problem or complaint with our Practice Manager or your Doctor so we can work to remedy the situation. If you remain unsatisfied you may wish to contact the Health Care Complaints Commission, Locked Mail Bag 18, Strawberry Hills NSW 2012 or phone 02 9219 7444.